Josef Jakobs – the Last Execution At The Tower Of London. Josef Jakobs, the last person executed at the Tower of London. The Tower of London, nowadys a popular tourist destination. Once also a prison, defensive fortress, a crime scene (if you believe, as I do, that the ‘Princes in the Tower’ were murdered here) and also the site of a number of execution. Anne Boleyn, Lady Jane Grey (who was the shortest-reigning Queen in British history, in office for only nine days), and of host of others. And it’s one of those others that we’re looking at today. If you’re thinking, as so many do, that the Tower’s reputation for executions ended in medieval times then you’d be wrong. 11 German spies were shot there in the First World War and one in the Second. 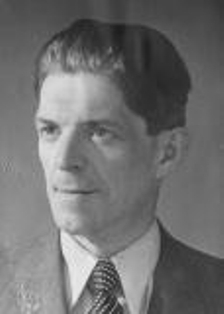 He was Josef Jakobs from Luxembourg, executed by firing squad on August 15, 1941, who holds the grim distinction of being the last prisoner executed at the Tower. August 15 was also the date, in 1961, of the last hanging in Scotland, that of Henry Burnett at Craiginches Prison in Aberdeen and, in New York in 1963, the last execution in New York State, that of Eddie Lee Mays (by electrocution). But I’ve covered Mays already and we’ll get round to Burnett in due course. It’s Jakobs we’re interested in today. Jakobs was a Luxembourger born on June 30, 1898. He was a veteran of the First World War (he served as a lieutenant in the 4th Foot Guards of the German Army), was drafted back into the German Army as an Oberleutnant (1st Lieutenant) in June, 1940 and then his career (and life) took a disastrous downturn when a previous conviction for selling counterfeit gold (and its accompanying stretch in a Swiss prison) saw him demoted to Feldwebel (Sergeant) and transferred to the Meteorologischen Dienst, the military weather service. His demotion also brought him to the attention of German Military Intelligence, the Abwehr, under Admiral Wilhelm Canaris, who recruited him to spy in England. Ironically, given Jakobs’ grim distinction, Canaris himself was executed for treachery on April 9, 1945 at Flossenburg concentration camp after his implication in the July Bomb Plot of1944 where Hitler narrowly escaped assassination. His being a Luxembourger wasn’t unusual, many agents recruited by the Abwehr were either non-German or indigenous to the countries they betrayed (such as Duncan Scott-Ford whom I’ve already covered). He was trained in espionage, equipped with £500 in forged money, a radio transmitter, a pistol, civilian clothes, forged identity papers and a sausage, an obviously German sausage which wasn’t all that smart of his recruiters as it would have stood out like a sore thumb in wartime Britain. Arthur Owens. Not a man of doubtful loyalties, because he simply didn’t have any. He flew out Schiphol Airport, in the Occupied Netherlands, landing by parachute near Ramsey in Huntingdonshire on January 31, 1941 and promptly broke his ankle on landing. Crippled and with no means to pursue his mission, that of discovering troop movements and monitoring weather conditions to aid air raids on British targets. He fired his pistol repeatedly into the air until two local farmers came to his aid. Charles Baldock and Harry Coulson promptly notified the local police and Home Guard who detained him for transfer to London. He was still wearing his flying suit with a civilian suit underneath and his equipment. Jakobs was promptly arrested and transferred to London to the secretive ‘Camp 020’ used for holding German spies while deciding whether they’d be more useful as double agents or simply be tried secretly and executed. Jakobs wasn’t seen as useful enough to be a double agent which made his trial, held secretly, a foregone conclusion. His trial was held in secret because the British wanted to protect the ‘Double Cross’ system used to ‘turn’ captured German spies and use them t feed disinformation back to Abwehr HQ in Berlin. 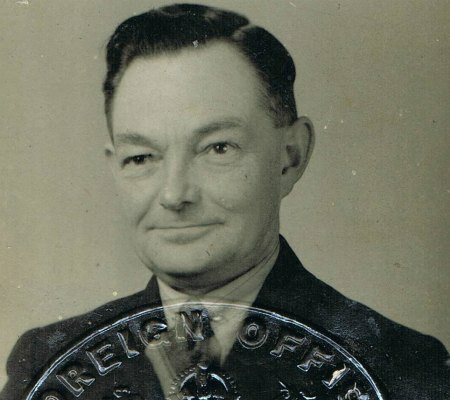 It was via ‘Double Cross’, at the instigation of a singularly unsavoury Welsh nationalist, MI5 agent, Abwehr agent and self-interested ne’er-do-well named Arthur Owens (codenamed ‘SNOW’) that Jakobs and many other German agents dropped into Britain and were almost immediately caught, then either ‘turned’ or executed. Owens was devious, selfish and only acted on one side, his own, while making as much money as he could from whichever side paid best at the time. He betrayed scores of Abwehr agents, knowing full well the fate that awaited them. He was an opportunist, a crook, a mercenary and quite possibly a psychopath. Jakpbs ended up at ‘Camp 020’ via Ramsey Police Station and Cannon Row Police Station in London. He was interrogated, harshly but not mistreated, by an expert in the art of mentally breaking prisoners, ‘Tar’ Robertson of MI5’s Section B1A to help decide if he’d be offered the chance of working for the British. 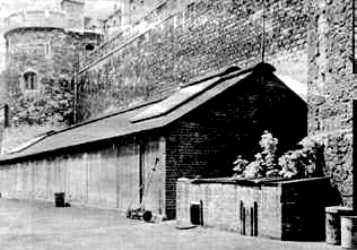 He was kept at Brixton Prison’s infirmary and again interrogated, thsi time by MI5’s ‘Tin-Eye’ Stephens, an even more ruthless interrogator who, like Robertson, disdained physical torture. Like a small fish, Jakobs was thrown back as not worth keeping. He was, in fact, thrown in among sharks. His secret trial was forgone conclusion, given that he’d been caught with spying equipment, had already admitted arriving for the purpose of espionage and hadn’t inspired any respect by readily offering to betray the Abwehr. If, MI5, reasoned, he would fold so quickly on capture then he’d be of no use to them. Jakobs spent another two months at Dulwich Hospital being treated for his ankle injury before his trial on August 4-5, 1940. Jakobs was given a military court-martial rather than a civilian trial with Lieutenant-General Sir Bertram Sergison-Brooke presiding. The evidence of eight witnesses, Jakobs himself and his own equipment was overwhelming and he was promptly sentenced to death by shooting. In deference to his being a soldier he was allowed shooting rather than the civilian method of hanging, affording him the chance to die like a soldier instead of as a common criminal at the hands of Britain’s chief hangman Albert Pierrepoint like Duncan Scott-Ford in 1942. Jakobs appealed to King George VI by letter, offering again to spy for the British and claiming he had always intended to turn himself in. It made no difference, the judgment was affirmed and his final, desperate appeal was rejected. His execution would take place on August 14, 1941 at the miniature rifle range at the Tower of London. Nobody had been executed at the Tower since 1747. Place of execution: The miniature rifle range at the Tower. At 7am that morning Jakobs, still hobbling on his injured ankle, became the last inmate to be executed at the Tower. He was assisted into a chair set up on the minature rifle range and a white target maker was pinned over his heart. An eight-man firing squad from the Holding Battalion of the Scots Guards, led by Lieutenant-Colonel Gerrard (Deputy Provost-Marshal for the London District) performed the execution. At 7:12am Gerrard gave a silent signal and a single rifle volley echoed round the Tower grounds. Josef Jakobs was dead. Seven bullets had struck him on or around the marker while one sturck him in the face. It was over. 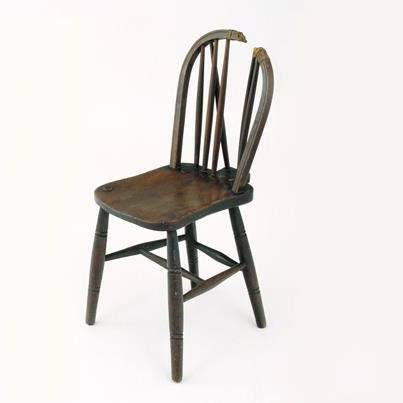 The chair in which Josef Jakobs died. Jose Jakobs was buried in an unmarked grave at St. Mary’s Roman Catholic Cemetary after his execution. Reblogged this on Robert Walsh. Previous Previous post: On Crime And Conversation – Criminal Slang In Everyday Use. Next Next post: Dawn Of Destruction – History’s First Air Raid.